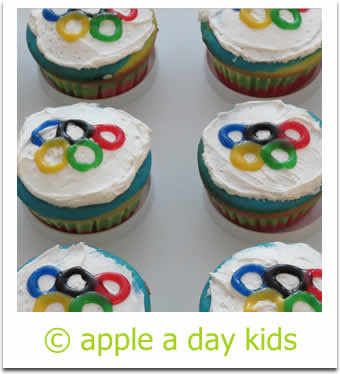 Jackie Fo: Go for the Gold with these Olympic Party Ideas! Did you spend your weekend glued to the Olympics? I most definitely did, and I loved every minute of it. Besides the more popular sports like swimming and gymnastics, the Olympics somehow make me excited about water polo and archery. Team USA all the way, of course! Plus Meredith Viera is back on the Today Show, so it really doesn't get any better than that. All you Meredith haters, don't show your face 'round here. I already have to deal with my mom watching Good Morning America instead of Today...blasphemy. 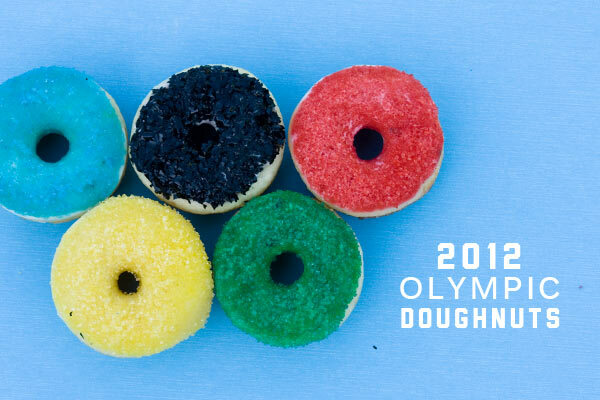 I have to admit that while I watched hours and hours of Olympic coverage, I didn't make one Olympic inspired treat. But I thought about it. Does that count? Honestly, I was just so tired from watching the athletes work so hard. I'm exhausted just thinking about it. If you want to be a little more ambitious than me and serve Olympic inspired treats before these fabulous games are over, here are a few fab ideas! 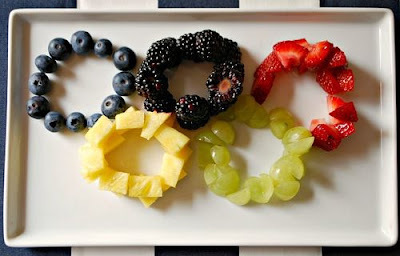 Fruit Olympic Rings. So simple, right? How about some cupcakes, with the rings piped in with gel frosting. So festive! The donuts are my personal favorites though. I'm not a huge donut person, but to be blunt, I would eat the crap out of these. 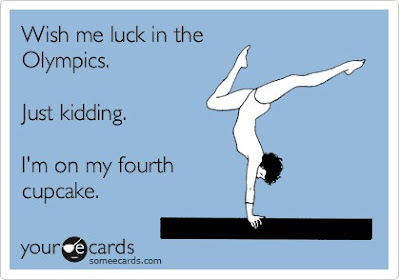 It's important to get into the Olympic spirit and all. This made me giggle. Although mine would be more like "I'm on my 2nd plate of cheese and 4th glass of wine." Cheese vs. Cupcakes anyday. Who's with me? Cute ideas my dear:) Hope you are doing well!!! I haven't had time to watch Olympics at all lol, but I hear it is super fun! Clever! Loving those fruit rings... and the doughnuts. Hehe. Cute ideas! I've barely gotten to see any of the Olympics...though we did dvr the girl's team gymnastics getting the gold. Hope you're enjoying the games for me!